I read an important book today. It is not a weighty theological treatise. It is not a book about spiritual formation. And it certainly is not written to inspire. This book is about homosexuality. Like it or not, in our culture, the topic of homosexuality has moved from stage left to center stage. Everyone is talking about it. Many people are affirming homosexual relationships – liberals and conservatives alike. I recently read Steve Chalke’s booklet, A Matter of Integrity. The author, who happens to be a Baptist pastor, seeks to legitimize and normalize homosexuality. The booklet is written with tones of grace and the author appears very kind. The only problem – the book is dead wrong. The book opposes Scripture. And the book fails to glorify God. Kevin DeYoung’s new book, What Does the Bible Really Teach About Homosexuality addresses a controversial topic with grace but never at the expense of truth. DeYoung has left no stone unturned here. In part two, he answers typical objections and responds with grace and truth. All his answers are supported by the weight of Scripture. The moral logic of monogamy is at stake. The integrity of Christian sexual ethics is at stake. The authority of Scripture is at stake. The grand narrative of Scripture is at stake. What Does the Bible Really Teach About Homosexuality will not be the most inspiring book you’ll read all year. However, it may be the most important book you read. It is a book that may cause you discomfort. 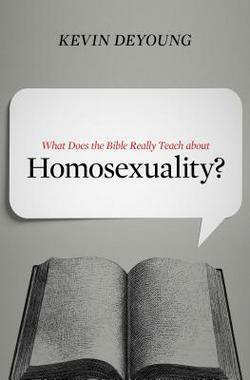 It is a book that will certainly cause you to reevaluate your position on homosexuality. Ultimately, this book will point you to the Book. And sacred Scripture clearly reveals God’s position on homosexuality. Homosexual behavior, like any other ungodly behavior, is sin; a sin which must be repented of and forgiven. The Supreme Court has spoken. Their historic decision on June 26, 2015, will leave an indelible mark on American history. But God has also spoken. Our sovereign God has the final word on every subject and in every nation. Our response must be to submit to his authority and render joyful obedience. Unfortunately, obedience is being jettisoned in the highest court of the land. May readers approach this subject with minds and hearts that are open to God’s revelation. May they be challenged and moved to obedience. And may the gospel open doors of hope so that many will find their rest in Christ the Savior!